I avoided making a nuisance of myself by not driving out to see the 2019 Nebraska floods devastation personally. However, I have spent a lot of time watching local news coverage and Twitter. We are currently studying vectors in honors pre-calculus and last week I was looking for real world applications to include in my lessons. One scenario involved a cell phone call for help in a mountainous region and a helicopter rescue. Nebraska is a long way from mountains but the footage below proved an incredible catalyst for making the math come alive for my students. The video below shows giant sandbags being filled and airlifted by Blackhawk helicopters to an island on the Platte River that houses one of the pumps for Lincoln Nebraska’s water supply. The goal is to fortify that pump with sandbags around it. This pump house is located on an island in the Platte River. This Google Map shows the island during normal river flows. The next video shows the helicopter dropping the sandbags at the pumping station. The following video shows two helicopters passing one another as they work to fortify the pumping station. I posed the following questions to my students. 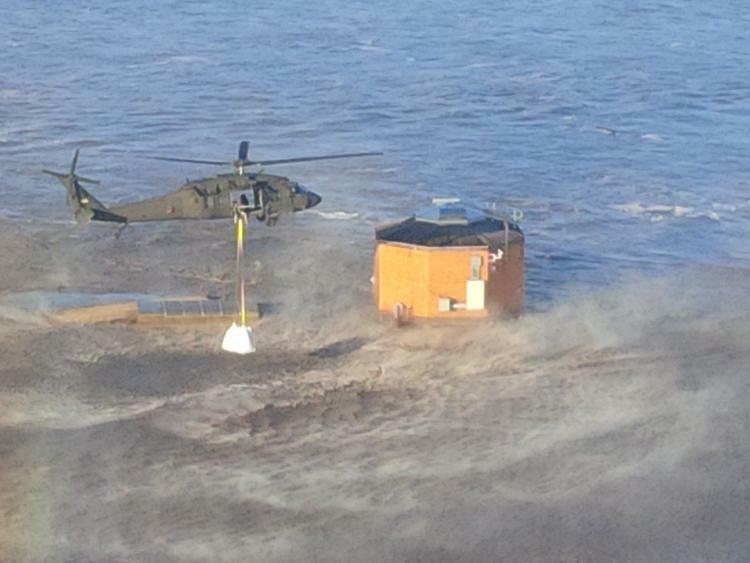 A Blackhawk helicopter needed to deliver sand bags to shore up a pumping station on the Platte River. 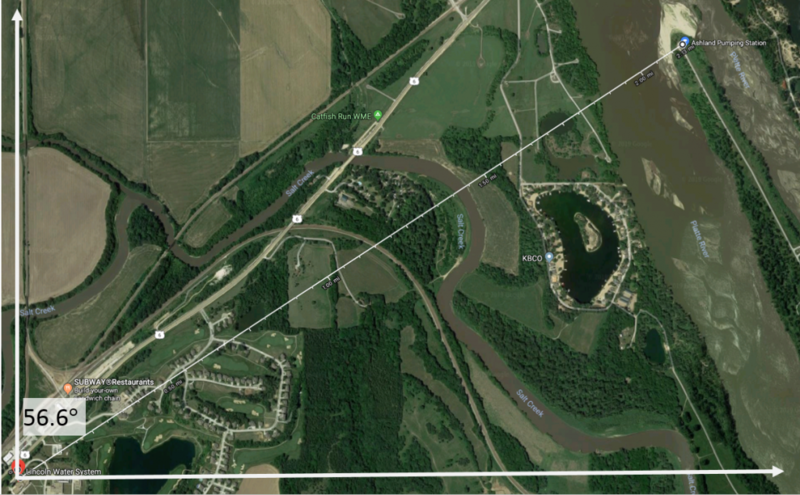 The station was 56.6° E of N of the staging area for the sand bags. 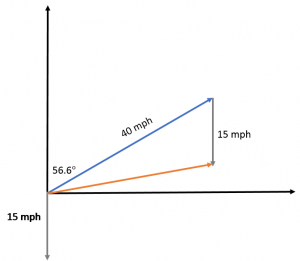 Due to the short distance, the helicopter flew at an air speed of 40 mph. The wind was from the north at 15 mph. What was the chopper’s ground speed? At what heading did the chopper fly to reach the pumping station? For another visual I posted this image. We discussed compass headings and why due North is 0 degrees in navigation. 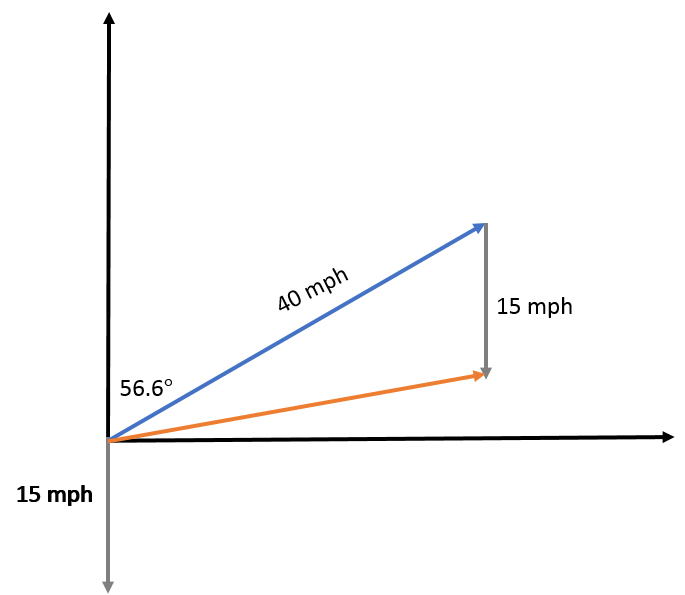 We also discussed air speed, wind speed, and ground speed. Then my students headed to their vertical non-permanent surfaces in groups to solve the problem. They quickly realized an earlier skill of adding vectors helped with this problem. The Law of Cosines, and Law of Sines also were very helpful. The best part was listening to their conversations and seeing light bulbs go on when they realized the factor the wind has on the problem and why the heading had to be modified. Of course, I had to take some liberties in creating the problem. I did not know how fast the choppers were flying. The wind speed was also an estimate. Weather.gov only makes 3 days worth of wind speed data available on their website so I was about 12 hours too late to get the actual speed for 7 am Saturday morning. I also do not know where the staging area for the sand bags were but suspect they were almost due north of the pumping station (based on Google images of sand dredging operations nearby). This would have substantially changed the problem, making it almost pointless to solve. I have found that sprinkling problems like this into my lessons not only engages students but they start to see how they could be called upon to use math in future careers. By their reactions, I doubt many aspire to be a Blackhawk pilot or an aviation navigator, but they don’t have to use much imagination to see the connections mathematics can make with future careers.